Startup Company - A walkthrough covering basic game play during the first two weeks (14 days). I have also included a few hints for what to plan for next. Provide your new startup with a fresh new name; one that is sure to excite the virtual community. Before you can begin, you will need to take out a loan of $40,000 to start your new company. This is a large loan and it comes with pretty high interest (30%). You will be locked into a $128.20 daily payment. This is a simple interest loan, meaning that paying it off early (before the end of the 365-day term) will not save you anything. But it would still be good to pay it off as soon as possible to eliminate the daily payment. You already have two (2) new e-mails - go ahead and read them. The first is a brief message from the developer with advice for where to start. The second is from the bank, thanking you for getting your loan from them - like you had a choice. The first $10,000 of this loan will be used to purchase space in a small building - enough for eight (8) employees. Your employees would probably like a nice environment in which to work. I like this setup. You can use whatever setup you wish. Just remember that you need to be sure and leave enough space for four more desks and you don't want to spend too much of that loan before you establish some sort of cash inflow. 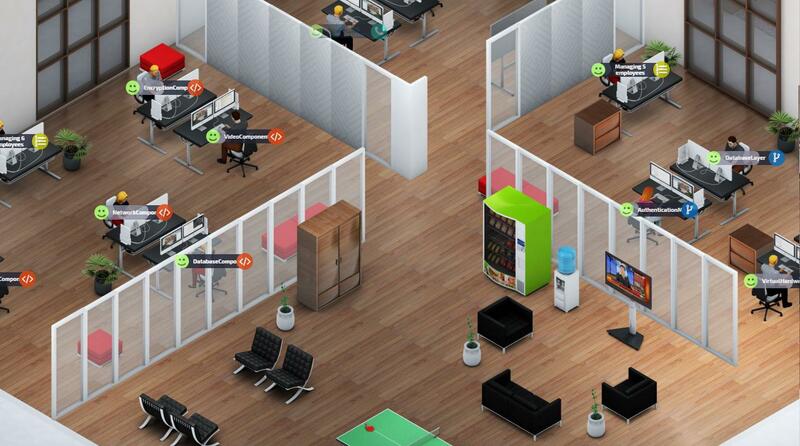 An attractive office will also keep your employees happier and more productive. Now that you have an attractive office, you need to get to work hiring employees. That loan isn't going to pay off itself. Recruit a Sales Exec. Recruiting is expensive. Since we are only looking for beginners, one day should give us a good selection. The list on the right took less than two hours of recruiting. 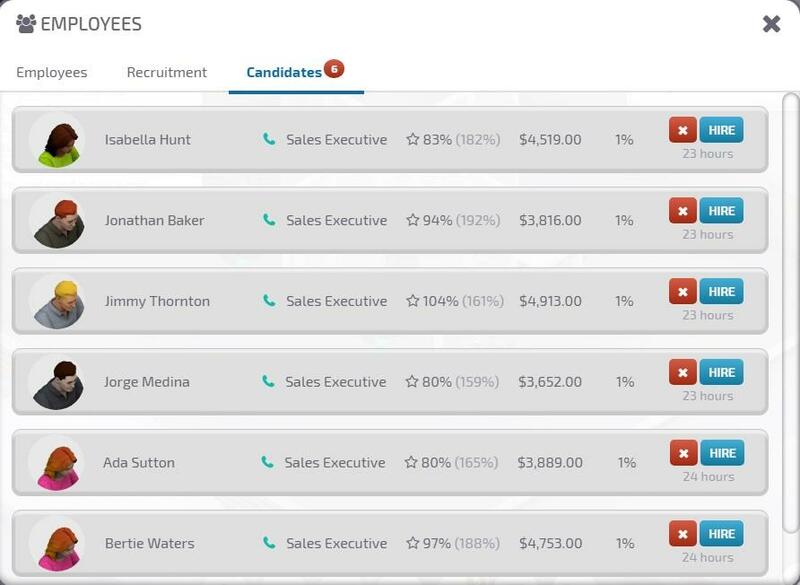 The recruiter provides you with the names of candidates as well as their speed, potential speed (with training) and expected salaries. It is good to look for someone who is fast, but you might be better with someone who is potentially faster. It's also good to look at that salary - you don't want to pay too much for a little bit of speed. I chose Jonathan Baker (second). He's third fastest right now, but has the highest potential. He also wants the second lowest salary. Don't forget to cancel the recruiting once you have made your selection. Once you have made your selection, you need to assign him or her to a desk so they can work. See, there's Jonathan hard at work training. I started him off training, because we don't have anyone to fulfill any contracts, yet and I don't want to pay him for being idle. Now it's time to recruit some Developers. You will need a lot of little mcomponents in order to fill contracts and to stockpile for later use by your Lead Developers, when you have them. Begin recruiting now. 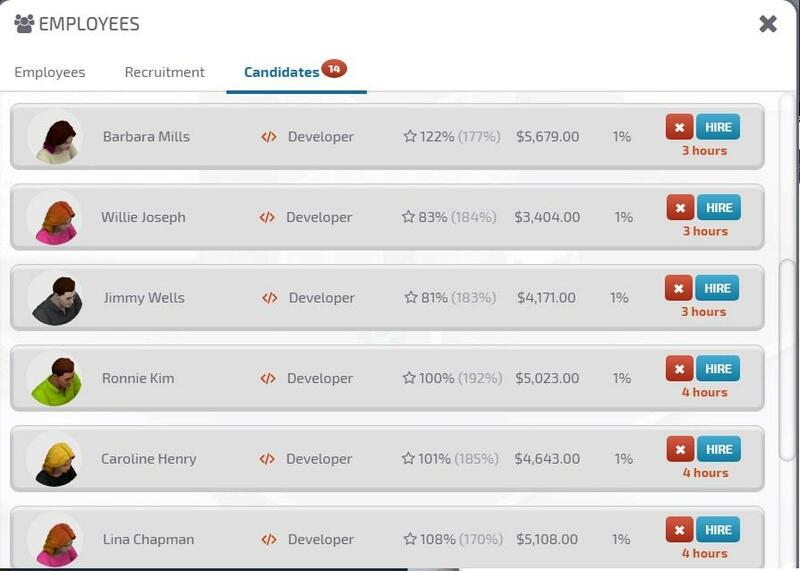 When you have five or six candidates, select one to start working for you and continue to generate a list of 10 or 12. Once you have your first Designer, you will want to have your Sales Exec look for a new contract. Your Developer cannot make a component until it has been researched (at a cost of $1,000). Go ahead and research the first five component and then click on the Encription Component and have the Developer work on this component first. Now, put your Sales Exec to work finding a new contract. Wait until day two to higher two more Developers. When the day comes to an end, the blue "Start Time Machine" button indicates that the work day is over. Click this button to fast forward to the beginning of day two. Note: I alwas make sure the game is paused before beginning the next day. It helps avoid making mistakes. You might be tempted to hire Barbara Wills. She is very productive, and that productivity may cause you to believe that she is worth that $5,679 salary. After all, she has a speed of 122. But her potential is only to have a speed of 177. For $3,404 you can hire Willie Joseph, who only has a speed of 83 right now, but with training, her speed can reach 184. Being careful to look at all the numbers can assure that you hire a good staff and don't spend an arm and a leg doing it. I begin Thursday morning by adding Willie Joseph to the payroll and putting her to work. I made sure that I researched all five of her components (at a cost of $1,000 each) and set her to work on a Database Component. Look, Jonathan has an offer for our first contrract. Vileo needs a Network Component and they are willing to pay $720 for it. That isn't very much, but it's only one component and we need the income. Neither of our Designers is working on one of these, but we do plan on hiring another designer. Besides, if we turn down a contract, that company will not offer another for 30 days and there simply aren't many companies offering contracts, so we take it. We will have 51 hours to deliver the component. Jimmy Wells was hired. His five components were researched ($5,000 more) and he began work on the needed Network Component. It should be noted, that until the contract is fulfilled, Jonathan Baker must continue to service it. He cannot look for another contract until this one is completed. Also, if we fail to deliver or cancel the contract, we will lose $240. Other, more profitable contracts might charge much higher penalties. You are paying a considerable wage to your employees, so it makes sense that they should not be left idling their time away. One way to manage your employees' time is to make use of the Employee Screen. By watching this screen, you can see as your employees complete a project; quickly pause the action; and select them from this screen. 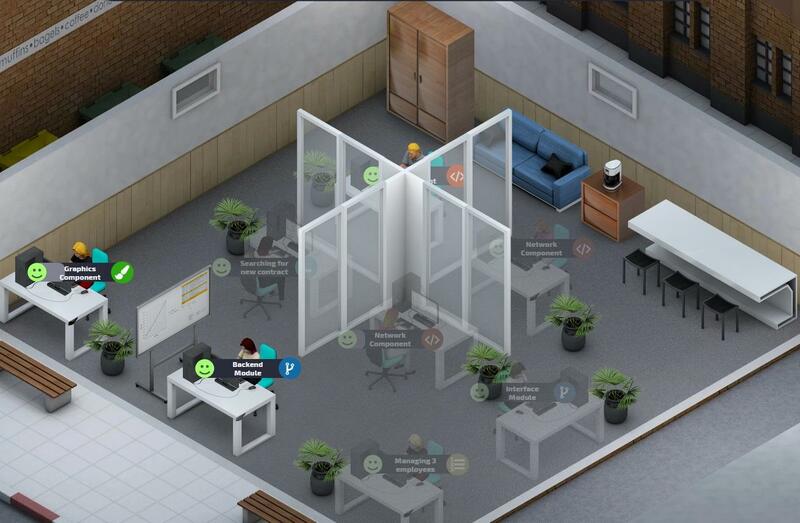 You can then assign a new task and pull up the Employee Screen again before starting the action again. At some point, fairly early on, you will accumulate enough experience to reach Tier Two. This unlocks a new type of employee - the Designer. It also unocks somenew furniture. When the opportunity presents itself (when you can afford it), you should purchase the Blue Couch and the Coffee Machine. These will help to improve the mood of your employees. Your staff are not going to get better at what they do without training, so Saturday is set aside as Training Day. Some of you may think this is unnecessary, but training your staff makes them more productive. They also need time off to improve their moods. There are a few things that you need to make sure of, however. First,if you are working on a contract, you must complete it before setting your employees to train or the contract will expire. You also cannot spend a whole day training or give your staff a day off if you cannot afford to pay your expenses. Open the Finance Screen and click on the Transactions tab. Add together the total expenses for Day 4. In this case $739. You will need twice this amount (or $1,478) in order to use Saturday as a training day and Sunday as a day off. Your numbers may vary. If you do not have enough, you will need to complete another contract, but you should definately try to give your employees Sunday off. Set all your employees to train on Saturday until 2:00 pm (14:00) and then stop their training and send them home. They will go home and also take Sunday off. Be careful not to click the button that sends them home for an extra three (3) days. Note: it is best to send your workers home early on Saturday. If you wait until Sunday morning, they will also take Monday off. When everyone has been sent home, you can click the "Start Tme Machine" button and automatically advance to Monday. It's time to add an additional member to your staff - a Designer. You should not hire a designer prior to day five. If you do not have at least $7,000, you should postpone hiring your Designer until you do. The cost of Recruitment, a desk, etc. will bring you too close to bankruptcy if you try. Accumulate the funds and hire one as soon as possible. Be sure to get a good list of candidates so you pick the very best one. Notice how much faster your employees are working after training and a day off. Once you have your Designer, you can assigne him or her to one of the three designs available, if you have $1,000 for the research. Don't forget that you will have to pay the salaries and fees at the beginning of the day on day 6. You do't want to go bankrupt when you are doing so well. Another option is to save the $1,000 until day 6 and have your new Designer spend the first day in training. Before long, the new contracts will begin asking for Designer components. You might be able to get by for a little while producing just one or two of these components, but you should begin stocking up on all three as soon as possible. Sometime during the second week, probably on day 6 or 7, you will accumulate enough experience to unlock Tier Three. Tier Three makes Managers available. Managers supervise your employees and keep them from idling by giving then work to do. They can make managing your game easier. Tier Three also unlocks a Small Retirement Plan. It can be activated from the Company Profile button and it is located in the Benefits tab. This is an inexpensve benefit that provides a good bonus to your employee moods. You should activate it as soon as possible. The third benefit for unlocking Tier Three is a Red Bench. It takes up too much space in this building for the benefit and should be ignored for now. You should hire a Manager to supervise your Developers as soon as you are able. Be sure to get a good lost of candidates before you make your selection. You should have at least $7,000 on hand, which should be enough to do the recruitment, buy a desk and afford salaries on the following day. Assign the Manager to supervise your Developers. A manager will improve your production a great deal and when he or she trains up to being Intermediate, he or she can manage five employees. Once you have assigned the Manager to your Developers, you can indicate a minimum stock for each component. At this point, three of each would be a good idea. Sometime prior to the end of week two (day 9 or 10) you should unlock Tier Four. Tier Four unlocks the Lead Developer. You should wait until the beginning of week three (day 13) to hire them. They take components created by Developers and Designers and weave them together into modules. Because of this, you will want to have a decent stock before hiring them. Tier Four also unlocks a Small Red Bench, a Bar Table and a White Board. You should purchase the White Board and place it somewher in your office because it provides a great office bonus. If you can find the space later, the Bar Table offers a great bonus, too. If you have any contracts pending, you should finish them up. Saturday should be a training day. We need to train our staff to get ready to progress to Intermediate level when Tier Five is reached. Set everyone to training and have them train until 2:00 (14:00), then turn off training and send them home. This way they will all be in great moods to start the day on Monday. Don't worry about projects they are working on. They will pick up right where they left off on Monday. The great thing about training Managers is the production bonus they give to those they supervise goes up with their training. This is a huge boost to work efficiency. Your bank balance should be looking pretty good by now. It's time to spend a little of it on your final two employees (at least until you move out of this building). Start by having your recruiter getting you a nice list of candidates. See if you can't pick between 10 or 12. You will need two more workstations for them. Their projects also require that you purchase some initial research. It's a bit more than for the others. You might begin by having one of them do the first two projects and the other can do the second two. This will work until you have more cash to give them access to all of their projects. Sence you wouldn't be expecting a full day of work from these two new employees if you hired them later in the day, it might be possible to wait until first thing Tuesday morning to hire them. Of course, you will want to be sure they will still be available. Because this particular business plan has only five days for production, it is important to plan a little bit of a budget. The budget must account for gaining enough funds from contracts in five days to cover seven days of expenses, plus a little extra for growth. Let's take another look at the Transactions on the Finance Screen. The daily expenses are $1,582. This means that for a full seven-day week, I must earn $11,074. But I only work for five days. Dividing the weekly expenses by five tells me that I need a daily income of $2,214.80 in order to pay all the monthly expenses. If we increased this amount by a modest 20% for growth, that would add $442.96 to what is needed each day for a total of $2,657.76. It is also important that we develope an inventory of these components an modules for later stages when we begin to build our own web-based content. Because of this, we don't want to get carried away selling everything we produce. If we fulfill one contract each day for $2,657.76 and spend the rest of our efforts stockpiling our products, we won't have any problems meeting contractual demands and we will see real growth. You should have no problem meeting this need for growth doing a few thousand dollars worth of contracts each day. Some days will result in huge contracts. This should not change the plan for the following day. Before too long, you should have enough fundage to pay off the loan. My suggestion is to do so. This lowers the daily expenses. When your employes max out their Beginner skill, upgrade them to Intermediate. This includes getting them new workstations. Don't forget to research their new components as they come available and go into the Production tab for the Manager and include the new components with minimum stock levles like 3 or even 5. Don't forget to adjust your budget calculations when your employees promote and get that $3,000 raise. You will be tempted to move into a larger building when you get $35,000. Fight the urge. $100,000 isn't that much more and you will be able to have a staff of up to 50 workers instead of 20. 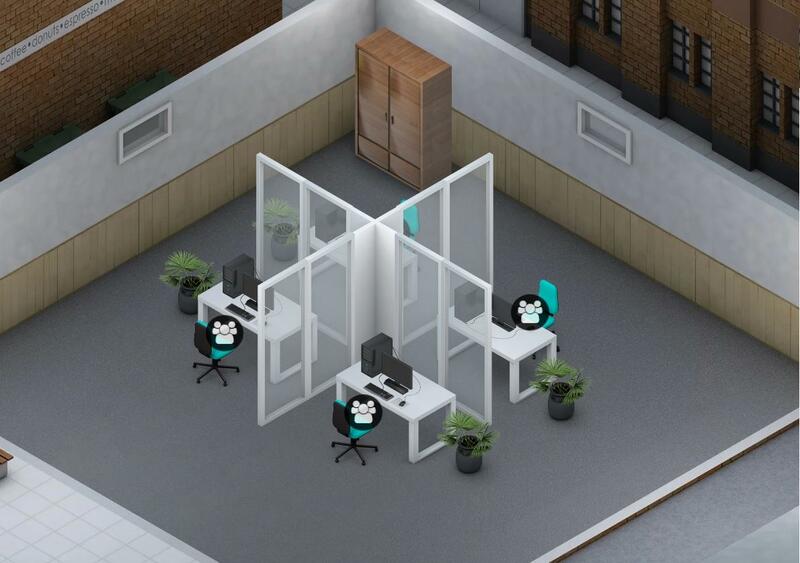 If you move into the $35,000 building, you will find that your cash will grow to $100,000 very quickly and you will want to move into the larger building anyway. Why waste the 35K for the middle step?